Unfinished capriccio showing a section of a ruined circular hall with a coffered and decorated ceiling around an oculus with niches in the walls, and a free-standing sarcophagus on a base in the centre. To one side is vaulting. 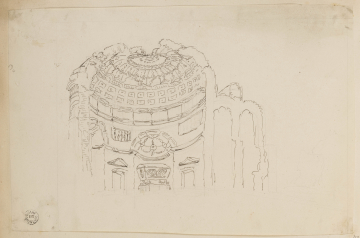 You are here: CollectionsOnline / Unfinished capriccio showing a section of a ruined circular hall with a coffered and decorated ceiling around an oculus with niches in the walls, and a free-standing sarcophagus on a base in the centre. To one side is vaulting. In the opinion of A. A. Tait, this drawing relates in time and place or subject to those contained in Adam volume 56. This drawing may be compared with that in Adam vol.4/104, with the various sarcophagus compositions in Adam volume 56, and a similar circular hall in Adam vol.56/92.